Visit Leslie Saxon's website here. 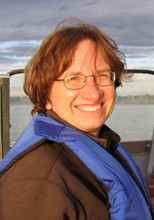 Leslie Saxon completed her BA and MA in Linguistics at the University of Toronto before undertaking doctoral studies at the University of California, San Diego. She taught at Memorial University of Newfoundland for six years before coming to the University of Victoria in 1991. She has carried out research with colleagues at the University of British Columbia, the University of Massachusetts-Amherst, the University of Toronto, the Dogrib Community Services Board, the Traditional Knowledge Research Group of the Dogrib Treaty 11 Council, and on community literacy projects with staff of Aurora College (Yellowknife). Since 2006 she has participated as a resource person in the community teacher education programs developed jointly by the Tłįchǫ Community Services Agency, the Tłįchǫ Nation, and Aurora College. Leslie has been involved with program development at the University of Victoria in the areas of applied linguistics and Indigenous language revitalization and maintenance. Visit the Tłįchǫ online dictionary and information about the Tłįchǫ dictionary for iOS. You can also check out the literacy manual and the 1996 dictionary on the Tłįchǫ website.